Meng Hongwei, the president of Interpol, was reported missing Friday morning after his wife told authorities in France she had not heard from him since he left for a family visit to China in late September. The South China Morning Post reported Friday that an unnamed source told them Chinese “discipline” authorities apprehended Meng for unspecified questioning as soon as he landed in the country. Prior to being elected to lead Interpol in 2016, Meng was a senior law enforcement and Coast Guard officials in the Chinese government. Meng lives in France, where Interpol is headquartered. Meng’s wife reported him missing on Friday, saying that he had not been seen since September 29, according to police sources. Police in France have reportedly confirmed that Meng arrived in China and did not disappear in France. The South China Morning Post also has a source insisting that Meng did not disappear in France. The Hong Kong-based newspaper adds another wrinkle to the story: a source confirming Meng is in Chinese police custody. “The 64-year-old official, who is also a vice-minister at China’s Ministry of Public Security, was ‘taken away’ for questioning by discipline authorities ‘as soon as he landed in China’ last week, the person said,” according to the Post. No details have emerged regarding why Meng was arrested or what he is being questioned about if the report is true. No law enforcement official has confirmed this report on the record at press time. In a statement, Interpol confirmed his disappearance and clarified that local authorities are responsible for the initial investigation, not Interpol itself. 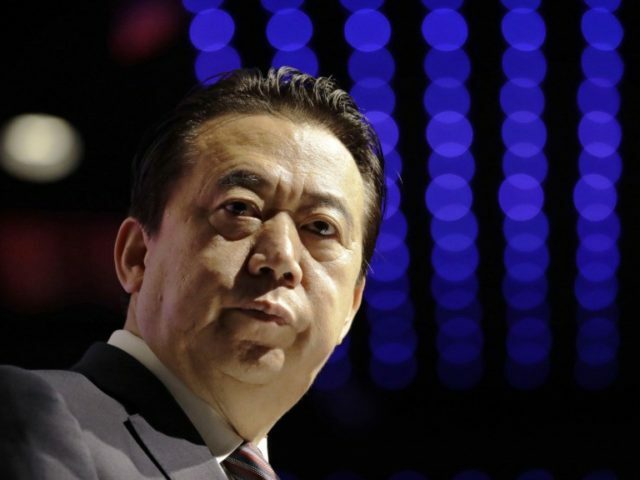 The organization said it was “aware of media reports in connection with the alleged disappearance of Interpol President Meng Hongwei” and that his disappearance was “a matter for the relevant authorities in both France and China.” According to Deutsche Welle, Interpol added that Jürgen Stock, the secretary-general of Interpol, is in charge of daily operations and they expect Meng’s disappearance not to have a major impact on how Interpol runs. The South China Morning Post notes that Meng is still named as a vice-minister of public security on Chinese government websites but is no longer a member of the Communist Party Committee. he lost his seat in April, after a significant controversy between Interpol and Xi Jinping’s regime. In February, Interpol announced it would cancel a “red alert,” a call for international police to make an arrest, for Dolkun Isa, the head of the World Uyghur Congress. China had applied for and successfully attained a red alert for Isa, claiming the activist was a “terrorist” and his group, which advocates for the human rights of China’s Uighur minority, is a global threat. Interpol, under Meng, determined that China had not sufficiently proven Isa was a threat. Isa, meanwhile, applauded Interpol but warned that his was far from a unique case. The majority of Uighurs are Muslims and live in China’s westernmost province, Xinjiang. Reports from Uighur advocacy groups show that the Chinese government uses its international arms, including its embassies, to intimidate and monitor ethnic Uighurs around the world. At home, China has forced an estimated million Uighurs into “political re-education” camps where they are forced to eat pork, learn Mandarin, and listen to hours of pro-Xi propaganda. Chinese police also regularly arrest family members of Uighurs who advocate for human rights abroad.